Need hedging plants for a much smaller hedge? Take a look at our list of low ornamental hedging plants for inspiration, we have evergreen, deciduous, flowering and prickly varieties - something for everyone! Small hedges are often seen as internal feautures within a garden, or to delineate flower and vegetable borders. Use them to line garden paths too, for something extra try a scented hedge that will release its fragrance as you brush past. Small hedges are typically grown from slower growing hedging plants to create a hedge of 100cm or less. While many larger hedge plants such as Portuguese Laurel, Green Beech and Privet can be maintained at around a metre, there are times when small is beautiful and the slower growing nature of these plants is more appropriate. Small hedges are usually grown from small leaved plants (so all is in proportion!) 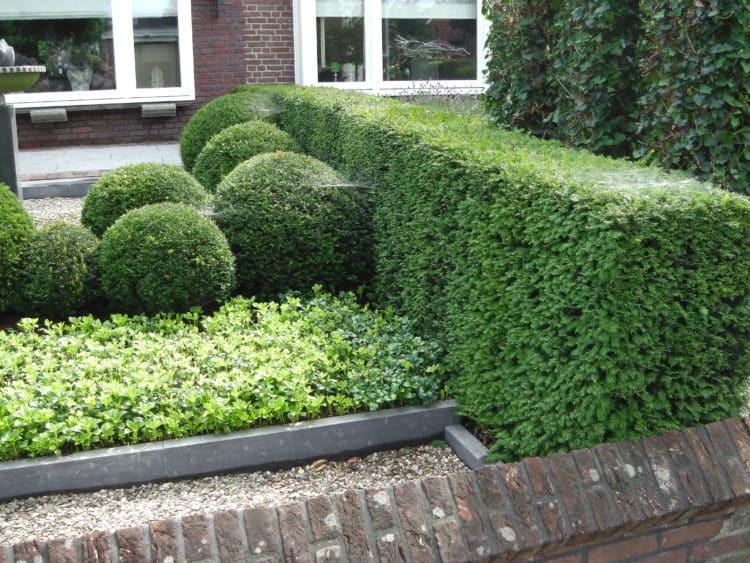 – the kind of plants that trim very neatly to produce immaculate little hedges by trimming several times a year if desired. All the small hedges on this page are of course easily maintained with a single trim each year and will still look great. Small hedges generally require more plants per metre of hedge to avoid gaps at the base, these being more noticeable in hedges of small stature. The good news is that most plants for small hedges are comparatively inexpensive. Small hedges are usually planted as decorative features within the garden rather than boundary hedges. They may be used to line paths, often with fragrant plants such as Lavender or Sweet Box where the scent can be appreciated as you walk past, many aromatic plants release their scent when your knees brush past them. Small hedges are a big feature of parterres and knot gardens, usually lining the edge of flower beds or vegetables. Their small size allows other plants to grow successfully around them and they do not obstruct the view, also they are small enough to step over allowing access to the beds. The formal hedging designs of knot gardens generally use green plain green hedging plants, more intricate designs often rely on a variety of foliage colours for contrast (and to great effect) such as the creamy splashed leaves of Variegated Box, the Silvery coloured Cotton Lavender or English Lavenders, the golden colour of Euonymus Emerald n’Gold, Japanese Holly Golden Gem or Lonicera Baggessons Gold. Other colours in small hedges can be achieved with Dwarf Purple Berberis, Pittosporum Tom Thumb and Photinia Little Red Robin. Small hedges give definition and structure to the internal parts of the garden, particularly if evergreen species are selected. A prime example of this is the White Garden at Sissinghurst Castle Gardens in Kent where the narrowly clipped Common Box hedges delineate the beautifully planted borders while also acting as a foil for the plants within the beds at the same time.